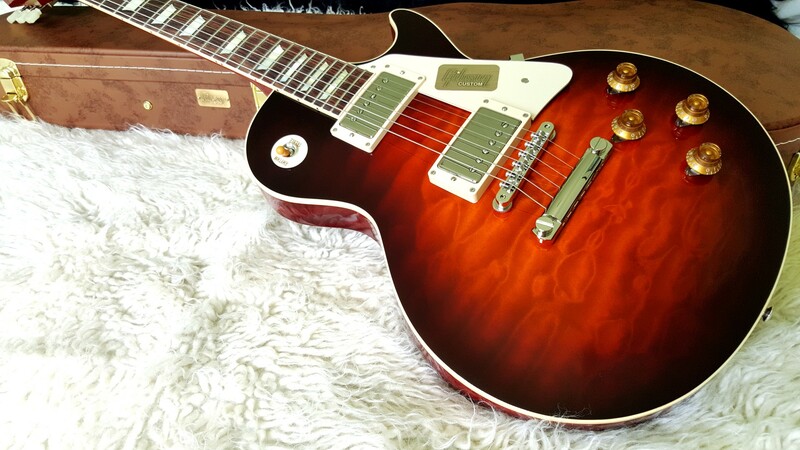 2015 GIBSON CS9 '50s Style 59 Reissue Les Paul Standard Gloss - Wildfire Quilt. Unique & rare. New in box - Slightly used - 100% mint - genuine made in USA. The most desirable Les Paul ever, re-created for player and collector alike, with '59-spec neck, accurate PAF-style pickups, period-correct appointments, and gently faded quilt looks. The CS9 '50s Style 59 Reissue Les Paul Standard from Gibson Custom brings today's player all the essential features of the world's most desirable vintage electric guitar, in a finely crafted instrument. Applying the previous generation of Gibson Custom Historic Specifications delivers all the period-correct details, with a figured maple top, an accurate '59 neck profile, two outstanding Alnico III Custom Bucker pickups, and an amazing Wildfire Quilt top. Put it all together and it's your fast track to the legendary looks, feel and tone of a '59 Les Paul. This is an amazing, absolutely stunning Gibson Les Paul 59 reissue, best guitar on the planet IMHO. You will dig this sweet guitar, classic warm tones, smoking hot lead tones, elegance style & grace, the Cadillac of the Les Paul family, meticulously handcrafted at the Gibson Custom Shop.